This was my for fun sketch today. A warm up for a longer drawing. I was surprised at how much I enjoyed this…it’s in my “no fear” sketch book. I really like the white paint marker, but it needs some ventilation! It can’t be healthy. I need to find a white marker that isn’t so toxic smelling. All these shells came from the outer banks of North Carolina. 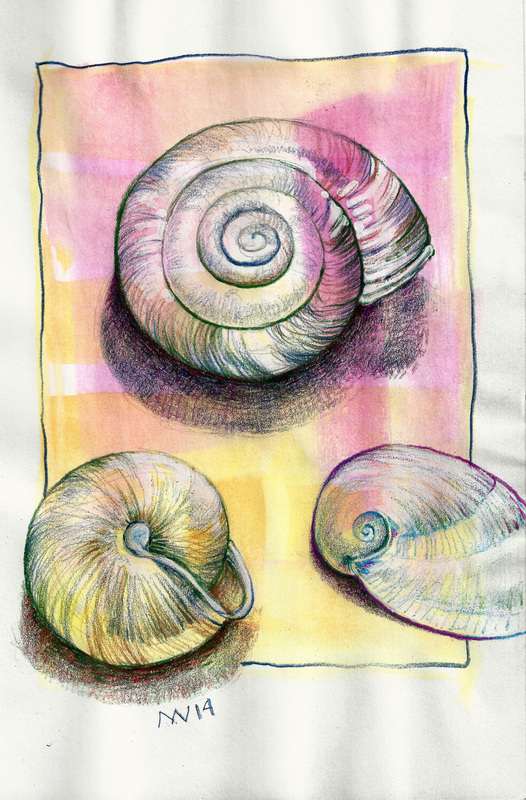 This entry was posted in Uncategorized and tagged colored pencil, drawing, shells, sketch, watercolor. Bookmark the permalink. I love it! Pretty colors and I like how the shells are outside of the frame. thanks so much! Sketchbook Skool has taught me to make borders for sketches, something that I never used to do.